I kind of go crazy if I don’t make a house about every week. I thought of this house to go with a specific challenge, but then realized it didn’t fit with the challenge rules. Fortunately, Simon Says Stamp to the rescue! The Monday challenge is “Things with Wings” so it fits here. 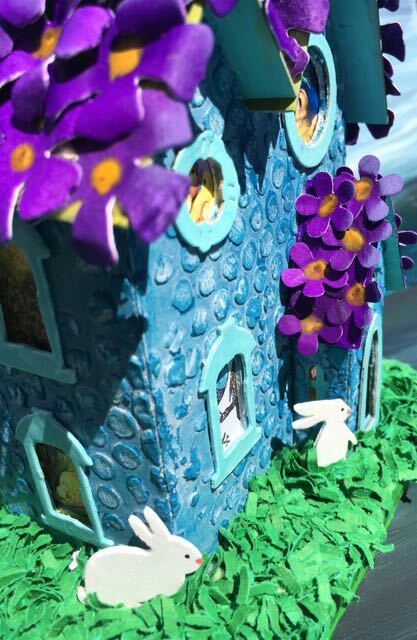 Violets on the Roof Easter House. 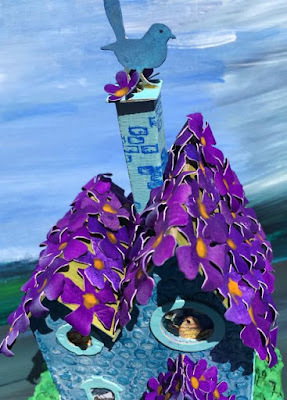 The violets are made with heavy watercolor paper that was curled and painted. 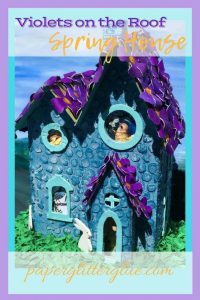 I figured violets on the roof would be perfect for Easter so I made a bunch from the smallest flower on the Tattered Florals Tim Holtz die. I painted a piece of watercolor cardstock with Wilted Violet Distress Paint then cut them out with the die. I indented the center of each flower on a piece of foam with an embossing tool and then curled the petals around a small metal crochet hook to give them more dimension. I painted the centers with a bright yellow. I would have preferred some paint which made a better blob in the middle but I didn’t have anything else. I could have used gold, yellow works better here with all the chicks in the windows. 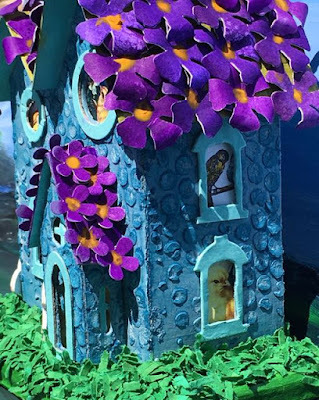 The house was painted with Tumbled Glass Distress Paint and then stenciled texture paste with one of the new stencils by Sizzix that just came out. I am eagerly awaiting the one that mimics stone, but it’s not here yet. I colored the paste with a Broken China Distress Crayon. The window frames are all from the Village Manor where I cut out the cross pieces to show the birds in the windows. Some of the cross pieces were used in the front extension which you can barely see in the picture above. Also there is the Easter grass. I wanted the base to look like it was covered with Easter grass, but I didn’t want to buy any. I figured I could make some by running green cardstock through my shredder. If you do that, be sure to run the shredder back and forth to get the regular paper out of the blades before you cut your colored paper. I put a piece of plain cardstock inside the shredder to catch the green cuttings. I am quite tickled about the Easter grass. 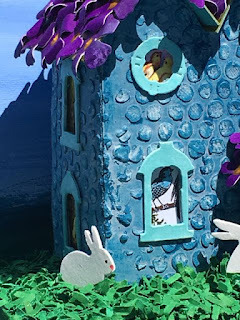 The bunnies were punched out of thick card stock. I glued about 3 layers together to make them stronger then added a nose and eye. The underlayer of the roof was painted with Peeled Paint Distress Paint. In retrospect, I should have used a watered down version of Mowed Lawn to match the grass better. 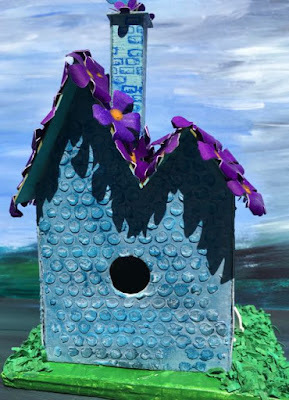 The bird on the roof is a Tim Holtz punch by Sizzix. I couldn’t get it to stand up very well so I used some tiny flowers to brace the bird on each side. The chimney is stamped with bricks from a Stampendous stamp set called Cottage Home. The smaller flowers on the front extension are from an EK Success punch. I still generally put a light hole in the back like traditional putz houses have, but I also made a hole in the base where an LED light can be inserted easily. Well, that’s the “Violets on the Roof” house. As always, I would have done some things differently, but overall I really like this house and I enjoy looking at it. Again, I am tickled about the Easter grass. 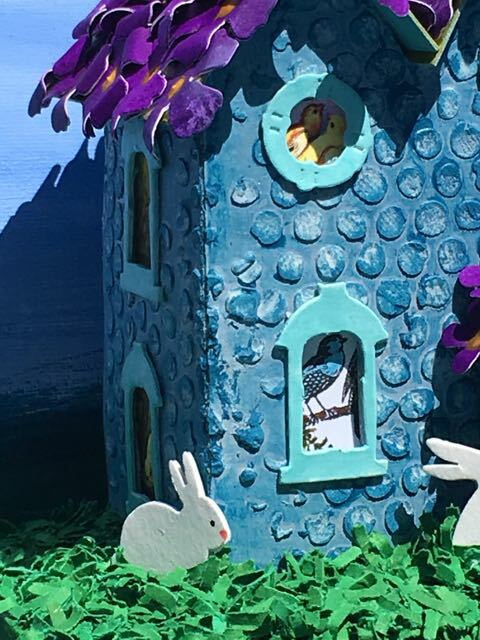 I think it adds a nice dimension to the base and the bunnies look so cute embedded in the grass. I am sharing this with the Simon Says Stamp Monday Challenge. I hope you are enjoying this spring. It’s warm here in Upstate SC. The temperature yesterday made it into the 80s, but nice and cool during the night. Take care. Feel free to pin this to your favorite board. That house is SO cute! I love the idea of the violets for roofing material. Very Easter! The voilets are wonderful and the Easter grass gets me thinkng of spring! Wow, this house is so pretty!! 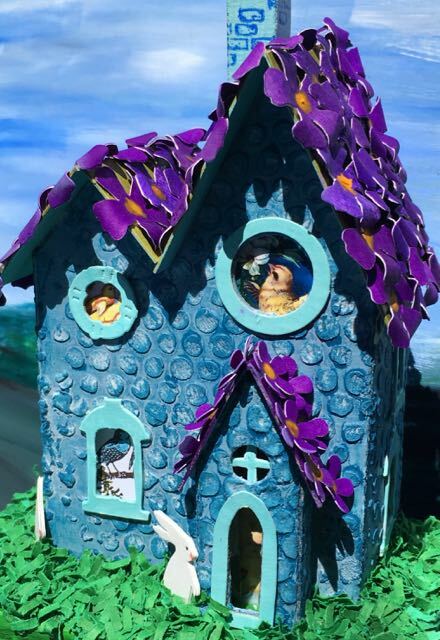 Love the colors, flowers on the roof, bubble texture. Fantastic project! Thank you so much for joining us in our Things With Wings challenge at the Simon Says Stamp Monday Challenge Blog!!! The flowers for shingles is so cute! I love the grass too. This is such a sweet little project. 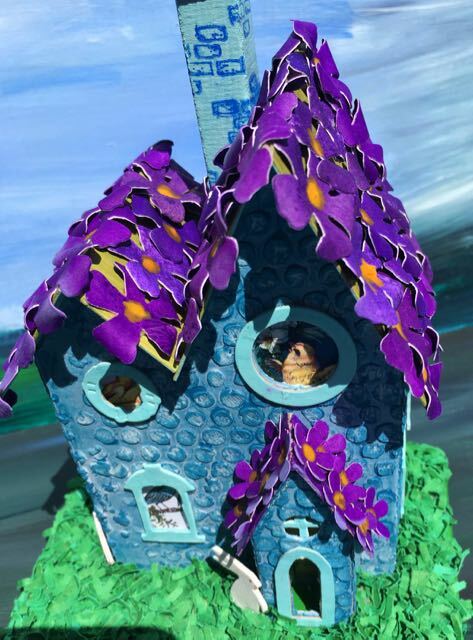 I love the violets on the roof! So perfectly springy and fresh. I’d love to have a little house like that for a fairy garden. Nikki, I’m sorry I didn’t reply sooner. 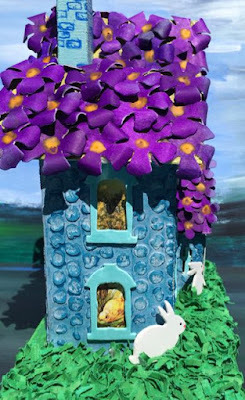 Thank you for your lovely comment on the Violets on the Roof house. When I started to make the violets, I wasn’t sure how they would look on the roof, but they worked great.